Passed into the arms of the Lord on March 25, 2019 surrounded by her family at the age of 83 years. Loving wife of Silverio for 56 years. Cherished mother of Juanito Asuncion and wife Virginia, Nela Crudo and husband Leandro, Rodel Samping and wife Francesca, Sylvia Mindorff and husband Chris. Proud Lola of Justin, Jovi, Erika, Jeff, Lee-Ra, Alexandria, Jade, Jordan, Amanda, Nicole, and Samantha. Dear sister in law to Ricardita Cabarles. Loved by 10 great grandchildren. 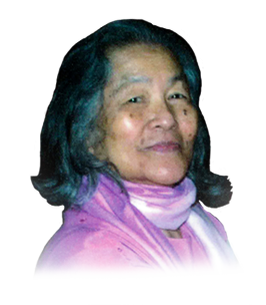 Survived by many nieces and nephews in Canada, U.S.A. and the Philippines .She was our matriarch and tried to always put her family first above all things. We will miss her quirky tendencies, and her incredible cooking.